In the 1880s, along with the rise of spectator and participatory sports, cycling races appeared in New Orleans. The city's first bicycle club, the New Orleans Bicycle Club, formed in 1881. All members belonged also to the League of American Wheelmen, the national organization formed in Boston in 1879, when the highwheel bicycle first appeared in the United States. These bicycles followed the "boneshaker" model, developed in the 1860s, and preceded the "safety." Both these models had two wheels of equal or near-equal sizes. The former used a pedal crank attached directly to the front hub. The latter used a chain crank attached to the back hub, the model that still dominates today. The highwheel, however, had a very large front wheel, which allowed greater speed; trailed by a very small back wheel, the pedals attached to the front crank. Gear ratios had not been invented. The large size of the front wheel allowed for greater speed. 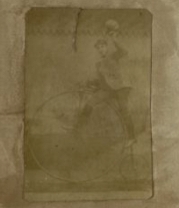 The diminished size of the back wheel as compared to the front earned this model the nickname "pennyfarthing." It was these bicycles that cycling pioneers rode and raced in the 1880s. 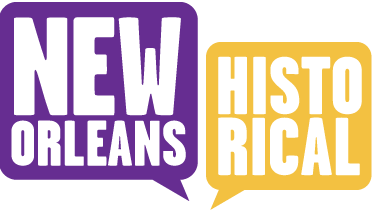 The first races held in New Orleans were road races. 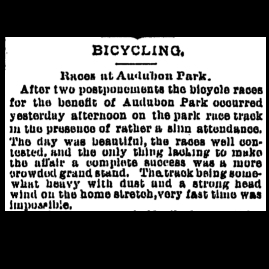 But in 1887, the Louisiana Division of the League of American Wheelmen held a tournament at the Audubon Driving Park track--the first cycling races held on a track in New Orleans. The event was held as a benefit for Audubon Park. After two rain postponements, the tournament took place on March 3. They had hoped the novelty of the sport would attract a large audience since interest in spectator sport was at a high in New Orleans and the race served to benefit the park. The turnout was disappointing. The Daily Picayune commented that the races should be held again. That Fall, the League held their 3rd Annual meet at the track. The affair was a grand one and very well attended, especially by ladies, who had become great fans of cycling races. 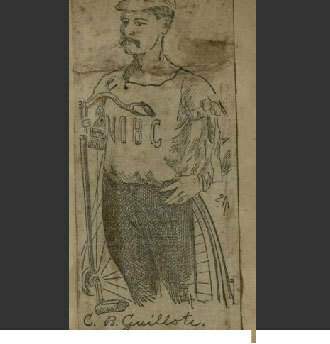 Lacar Musgrove, “First Cycling Races Held on a Track in New Orleans, 1887,” New Orleans Historical, accessed April 24, 2019, https://neworleanshistorical.org/items/show/533.